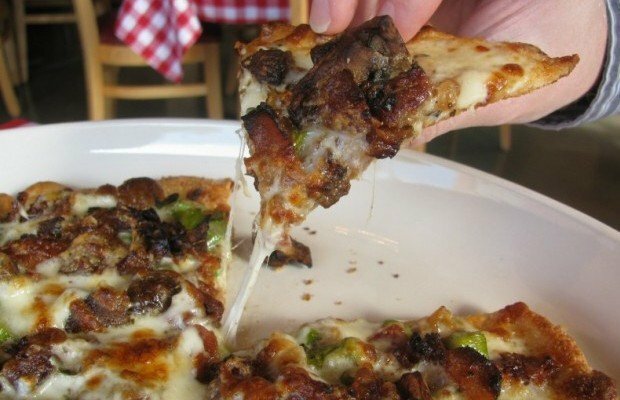 Madison diners voted in droves this week for their favorite slices of local pizza. Using input from readers and staff, the Cap Times created a list of some of the Madison area's more unusual slices and then asked for your vote. The results -- in reverse order, with the top vote-getter at the end of the gallery -- are below. Let us know what you think in the comments. No. 11: In the Cap Times poll of top-notch specialty pies, greens were a theme. The Alpina ($11) at Cafe Porta Alba doesn't automatically come with arugula (you have to add it on), but trust us — that's the best way. The crunch of the greens goes so well with the walnut puree, mushroom and fontina. No. 10: When Luigi's reopened on Midvale in 2011 after a seven year hiatus, the bada bing pizza ($10.99/12 inches) became the pie to bring people back (a cannoli bar and wine on tap didn't hurt, either). Topped with smoky bacon, tiny pieces of asparagus, sweet caramelized onions and earthy mushrooms, the bada bing's white sauce and fontina cheese integrate perfectly. No. 9: The Barberini ($14) at Grampa's Pizzeria on Williamson Street is a beautiful pie: creamy white ricotta, small, hot red peppers called Calabrian chilis, fresh garlic, lightly spicy watercress and a drizzle of honey on top. Measuring a foot in diameter and cut into small rectangles, it's a little bit sticky to eat, but so worth it. No. 7 (tie): Since the unassuming, signless restaurant on King Street opened in 2004, Natt Spil has provided many reasons to return: a long yet approachable wine list, delicious dim sum, DJs on weekends. Their creative wood-fired pizzas ($10.50), including one topped with housemade sausage, tomatoes, goat cheese, red onion and pepperoncini, are slightly charred and come to the table bubbling. No. 7 (tie): The Algo Malo at The Roman Candle Pizzeria ($14.99/12 inches) may sound like a long shot. But really, blue cheese, walnuts, roasted beets and arugula is a classic salad combination. Alfredo sauce, caramelized onions, garlic and a slightly pillowy crust only make it better. With Roman Candle locations on the east side of Madison, Middleton, Fitchburg and soon, Whitefish Bay, the following should only get stronger. No. 6: Pizza Brutta, a Neapolitan-style pizzeria on Monroe Street, has some avowed fans. On The Capital Times Facebook page, Kate Katzban-Beren raved, "their (no longer available this year) seasonal heirloom tomato pizza is amazing. Their simple margherita is a fabulous deal at $8 and really raises the bar and if you want something heavy with mouth-watering ingredients, the caponata delivers." 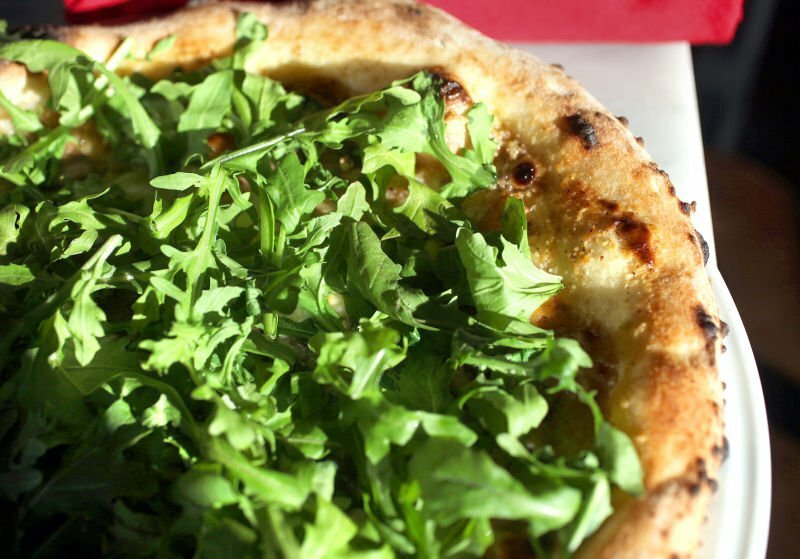 It was hard to pull a favorite, but we ended up choosing the Rossoverde ($12/12 inches), a popular red-sauce pizza with fresh mozzarella, prosciutto and a fresh topping of arugula. No. 5: One Yelp reviewer called the Super Hot pizza from Paisan's Restaurant "healing." Made with pepperoni, sliced onions, banana peppers and hot spicy cheese, it's $9.25-23.90 at the restaurant overlooking Lake Monona. No. 4: Tucked in the basement of the Italian Workmen's Club on Regent Street, the Greenbush Bar doesn't have specialty pizzas, but leaving it off the list was not an option. With perfectly crispy crust and options like Petaconica hot dogs, roasted peppers, artichoke hearts and gorgonzola cheese, pizzas here ($10-13 to start, plus toppings) never fail to please. Above, a combination of Italian sausage, green bell peppers and goat cheese would cost $19.35 for 12 inches. No. 3: The best-selling mac 'n' cheese pizza at Ian's Pizza on State Street ($3.50/slice) has become a Madison calling card. One national reviewer, writing for Serious Eats' Slice blog, pointed out that while the pie's origins have to do with what drunk college students are looking for past midnight, it's not a bad slice for all that. "The bottom of the crust had some nice browning," he wrote. "The layer of mozzarella is substantially thicker than the crust. As you might expect, the Wisconsin-made cheddar cheese was the dominant flavor on the pie, but it worked well because a) cheddar cheese is delicious, and b) it was applied moderately enough that it did not overwhelm the slice." No. 2: The Fetalicious ($11.95/10 inches) is consistently a top-seller at Glass Nickel Pizza Co., which has nine Wisconsin locations including four in the Madison area. Yelp reviewers call the Fetalicious "absolutely delicious" and "fantastically fresh." A combination of chunky tomato sauce, fresh spinach leaves, red onion, tomato, mushroom, and "house blend" plus feta cheese, it's vegetarian-friendly too, with options for a thick and pillowy or thin cracker-style crust. No. 1: By a mere handful of votes as of midday Thursday, Salvatore's Tomato Pies in Sun Prairie prevailed with its fig and bacon pie ($22/16 inches), a glorious combination of sweet wine-poached figs, salty gorgonzola cheese, Nueske's bacon, balsamic reduction and fresh mozzarella. It's more expensive than most, but it's worth it: "Pure genius," wrote one Yelp reviewer. "A divine combination of savory and sweet, tender fruit and decadent pork fat," we wrote in a 77 Square review. Delicious. Glass Nickel Pizza Co.'s Fetalicious took over the lead in our poll of the Madison area's best pizzas.